Well, she is back and ready for anew movie project together with Kapamilya stars Xian Lim and Angel Locsin. 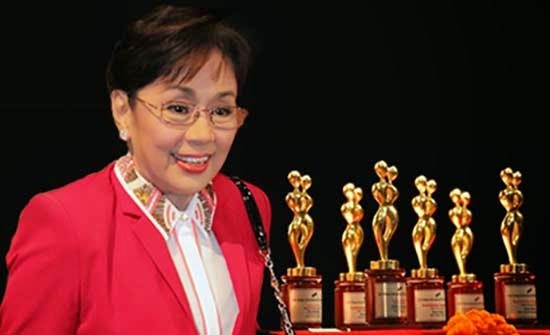 Vilma Santos will face again to the cameras and will do the award-winning act as an actress. Fans and friends of Vilma for sure will be very much happy after knowing this great news. For Batangas Governor and one of most sought Actress in the Philippines, Ms. Vilma Santos is coming back in cinemas. The yet untitled movie which will be directed by Bb. Joyce Bernal said Santos will portray a rich businesswoman, while Lim will be his Son and Locsin as her personal assistant. According to Santos, this will be her first time working with Direct Bernal and Lim, while Locsin is a bit anxious working with her Boyfriend's mother on this Movie. Lim on the other hand is very much honoured working with the two most lovely actresses in the Philippine Showbizness - Gov. Santos and Locsin. Now all we need to do is wait for the announcement and teaser of the movie. Vilmanians should bookmark this page now and wait for an update. Comments or suggestions about "Vilma Santos is back on the Big Screen" is important to us, you may share it by using the comment box below.